Not to be outdone, the Red Sox have made a major acquisition on the heels of one of the biggest trades in NBA history with the Celtics acquiring KG. Rangers closer Eric Gagne appears to be a done deal and headed to the Red Sox, possibly in exhcange for Kason Gabbard and other minor league prospects. 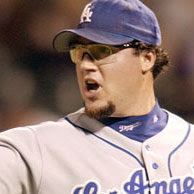 The addition of Gagne sets up a lethal 7-8-9 of Gagne, Okajima and Papelbon. If Kason Gabbard has indeed been dealt I can't help but feel a bit saddened, but with Lester back in the rotation, Schilling on the mend, Julian Tavarez in the bullpen and the possible return of Matt Clement this season the Red Sox have no business hanging onto a promising pitching prospect like Gabbard. The acquisition of Gagne also blocks the Yankees from picking up a highly touted free agent to help them make a playoff run. The Globe is reporting that the KG trade is now "down to details" with a follow up Jackie Macmullan article praising the celtics for finally pulling the trigger. I'm full of mixed emotions. 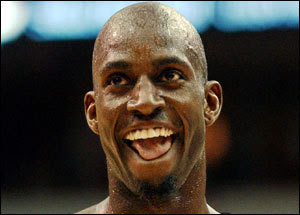 This trade makes the Celtics serious title contenders with the trio of Ray Allen, Paul Pierce and now KG on the court. As excited as I am by this prospect, we're putting all of our eggs in 3 over the hill baskets. Maybe I've been watching the Yankees a bit too closely but I've started to come around to the philosophy that "A bunch of overpaid aging superstars does not a winner make". In the acquisition of KG and Allen the Celtics have completely sold out their future. Al Jefferson can flourish as a superstar and play his best years in Minnesota. Next year's first round draft picks are gone. We're all in, this is the year, we'd better get there this year because there is very little else in the works for the future. The Sox made an impressive debut to the second half by shelling Roy Halladay for 4 runs in the first inning. Tonight's heroes were the returning All Stars David Ortiz and Manny Ramirez, combining for 5 RBI's and going 5 for 9 on the night. Even Julio Lugo managed to hold off his critics for another day by hitting two singles off of Halladay. No RBI's or runs for Lugo as Coco Crisp was called out at home plate on his first hit and the second was the only hit of the third inning. Tonight's performance was just enough to push Julio's BA above the Mendoza line and with any luck may indicate a turnaround for Julio in the second half. Tim Wakefield managed to keep things interesting by giving up 4 runs in his six innings of work before Manny Delcarmen, Hideki Okajima and Johnathan Papelbon put up a scoreless inning of work each to secure the win for Wake and the save for Papelbon. I'm always happy when the sox beat up on an All Star Caliber pitcher like Roy Halladay. Toronto was forced to fall back on it's bullpen and use 4 different relievers because Halladay was unable to put up more than 5 innings before being pulled. With the next 3 games against Toronto's less highly touted pitchers this early burden on the Toronto bullpen could be significant. The Midsummer classic is almost hours from getting underway and I am remarkably unenthusiastic despite the six representatives from the Red Sox and the very real possibility that the outcome of this game could give the Red Sox home field advantage in the World Series, but let's not count our chickens before the all star game. The only Red Sox player who made the starting lineup is David Ortiz in the 1B spot due to the fact that the game is in an NL ballpark this year and as such there is no DH. I wonder if Big Papi had to look around to find his glove. The rest of the nation got a taste of "Manny being Manny" as he went MIA shortly after arriving in San Francisco and skipped various media functions. I really don't think Manny should have been an All Star selection this year. He's not starting, he's had a bad season thus far and he seems lethargic about attending at best. It pains me to think that a player who had a great first half and would have relished the opportunity to go to the All Star game is at home with Manny in his place. Part of me wants the NL to win the All Star game just to break the trend, but with the Red Sox sporting the best record in baseball and an encouraging second half schedule I'd like 4 Games in Boston. The Home Run Derby is now a matter of record. Vlad Guerrero came back for the big win after getting a replacement bat from Big Papi on the sidelines, a matter which seems to have generated some serious controversy....like somebody would bother to cheat by using a cork bat in a relatively pointless exercise like the home run derby. I fail to see the appeal of the home run derby. The excitement and appeal of a home run is it's suddenness and unpredictability, a contest like the Home Run Derby removes those aspects entirely. The Sox were victims of their second 3 game sweep of the season as they were swept by the Tigers before heading into the All Star Break. The last two games were especially painful as the second game of the series stretched deep into extra innings before Johnathan Papelbon hit Gary Sheffield, Sheffield stole second base after a seemingly endless number of checks on first by Papelbon, and finally Papelbon giving up the big hit to Ivan Rodriguez with two down, the ball just escaping the outstretched glove of Coco Crisp. This makes the Red Sox a dismal 1-4 in extra inning games on the season. There's something really demoralizing for a fan after a loss like this. Perhaps it's the feeling that somehow your loyalty as a fan and staying to watch despite the painful scoreless innings will pay off with a win. With the additional stress this places on the bullpen to lose a close game like that can really throw off a team's rhythm. This inability to get over the hump continued into the next game where Daisuke had a terrible performance and couldn't keep the ball inside the ballpark. This ended in another heartbreaking loss for the Red Sox losing 6-5. I never really considered this to be a game. The Devil Rays are the Devil Rays and Josh Beckett is Josh Beckett, you do the math. Were the fireworks at the esplanade on the fourth or at Fenway on the fifth? I couldn't tell. The sox put up 15 runs setting a new season high and everything after the first inning was no more than a formality and a chance for the sox to bolster their batting numbers. Beckett ate a few innings pitching for contact and efficiency giving up some harmless runs in the process on the way to this game mercifully being brought to an end. The Red Sox take their 4 game winning streak into Detroit to face the still potent Detroit Tigers in a 3 game series before putting 6 All Stars on display in San Francisco. The Rays drag their 11 Game losing streak into Kansas City and hope to snap this streak against one of the few teams in the same category of terrible as the Rays themselves. One of the major factors that cause experts to call the AL East a lock is the nature of the Sox's 2nd half schedule. 75 Games left, 15 (that's 20%) of those games are against the Tampa Bay Devil Rays, the team with the worst record in the AL, the team currently on an 11 game losing streak, the team that just got swept in 3 games by the sox including the embarrassing rout last night. The schedule beyond that is also somewhat unimpressive with only 20 Games against teams with records above .500 (4 v. Twins (.512), 2 v. A's (.518), 4 v. Indians (.600), 3 v. Seattle (.561) and 7 v. Angels (.612)). I'm a superstitious man at heart, so all I will say is that the Yankees certainly have their work cut out for them to catch the Sox in the second half. I really shouldn't post this information, but I've devised a really great strategy for slowing down the Red Sox offensive production.....ok......wanna know what it is......? If you've got two outs and open bases, walk the bases loaded and pitch to Julio Lugo, and by pitch to, I mean throw strikes, I have NEVER seen such a bad hitter draw so many walks. I'm personally very put off by this whole situation regarding Julio Lugo's slump. When Lugo was still in his hitless streak he suggested that fans should not be on his back because the team was still winning. Yeah, we're winning, but no thanks to you. I personally hate that kind of attitude from a slumping player. I also hate this "the slump is over" attitude ever since Julio broke his hitless streak. It's not as though Julio is now swinging the hot bat, carrying the Boston offense and making a serious run at matching his career numbers. He's managed to get a few hits against one of the worst teams in baseball. Last night everybody with more than two AB's managed to put up at least two hits.....except Julio Lugo of course. The way I see it Julio's got a long way to go to get out of the doghouse. Jacoby Ellsbury's time in the big leagues seemed to prove emphatically that he does indeed have what it takes to play at the big club hitting .375 going 6 for 16 and drawing two walks and showcasing his exceptional speed. I wonder if he's interested in learning to play shortstop? The Red Sox managed to place 6 players into the All star game this year: David Ortiz, Manny Ramirez, Johnathan Papelbon, Josh Beckett, Mike Lowell and Hideki Okajima. 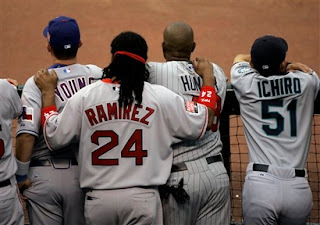 I'm always glad to see Manny Ramirez and David Ortiz in the All Star game, but it pains me to think that they're really reaping the benefits of being big names in a big market club and covering their sub par numbers. Manny's numbers in the first half are well short of All Star worthy with his power numbers and batting average noticeably down from career averages. I was glad to see Red Sox Nation/Japan come together to get Hideki Okajima into the All Star game. His unprecedented and unexpected production for the Red Sox has been crucial to the Red Sox success and his numbers compare well to any reliever in the majors.